Description: 100 is with its train at Loris, SC in this 1998 photo. Description: A rare find on the CALA was, and is, four units all in the same paint. One of theF units is now scrapped. 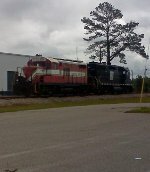 Description: A nice GP18/F9A/GP30 trio is on ex-Atlantic Coast Line rails in Conway, SC on July 31, 2006. Description: Sitting on the "pit" track by the yard office in Chadbourn. Description: Unit is testing with B-unit on pit track. Description: Carolina Southern GP18 100 sits with a GP38 at Homewood SC. The two units sat dead on the CALA "main" just north of Conway over the Fourth of July weekend with three gons. Description: I heard the chatter on the scanner and followed it to the trains!